Following a year long project funded by the Big Lottery Fund and the BBC Breathing Place’s campaign, Gloucestershire Wildlife Trust is inviting residents of the Wotton-under-Edge area to come and see what has been happening at its Old London Road nature reserve (alongside the Conygres Scout Hut). 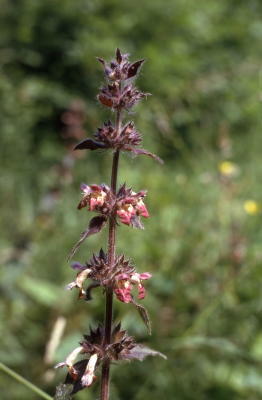 The nature reserve and the surrounding woodland is one of only two places in Britain where it is possible to see the rare Limestone Woundwort plant, and now is the time to see it in flower! Visitors to the Open Day on Sunday 22nd June from 11am will be able to meet the plant, learn about the management that local volunteers have been doing to preserve it, and see the other work that we have been doing at the site – the laid hedge, the new leaflet, the pond, and the bench specially designed and built by students at Katherine Lady Berkeley’s School. Afterwards county plant experts will be leading a guided wildflower walk to North Nibley monument (places on the walk are limited so we ask that people book on 01452 383333). For those not wanting to walk so far there will be a family nature ramble in and around the reserve for budding explorers – looking for bugs, small mammals, butterflies and other creatures. For any more information, pictures, or to speak to anyone before the event, please contact me on the details below.